There are more than 80 food items served on-a-stick at the Minnesota State Fair. Now, fairgoers can add a freebie to that list. 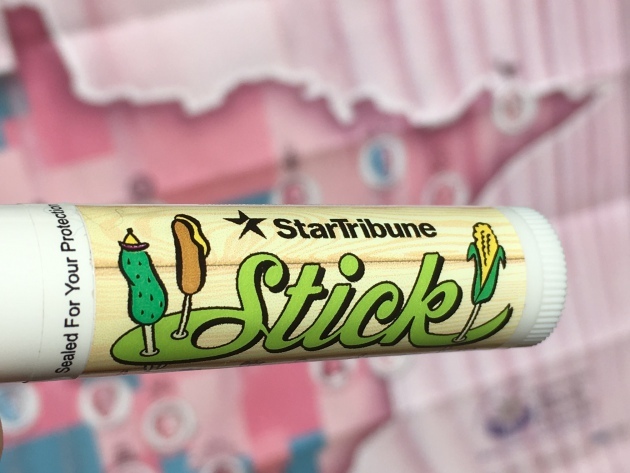 Visitors to the Star Tribune booth (find it on Carnes Avenue at Clough Street, in front of the grandstand ramp) can pick up a free tube of "Stick" flavored lip balm. While supplies last, of course. Free lip balm -- in summertime, fair-themed flavors -- is a Star Tribune fair tradition. Previous incarnations have spotlighted the wonders of bacon, mini-donuts, ketchup, mustard and fresh-cut grass. No word on whether then-Vice President Theodore Roosevelt's famous "Speak softly and carry a big stick" speech -- delivered at the Minnesota State Fair's Grandstand on Sept. 2, 1901 -- had anything to do with this year's "Stick" theme. The Minnesota State Fair opens Aug. 24th and runs through Sept. 4.